SOUTHFIELD, Michigan -- Fiat S.p.A. has increased its stake in Chrysler Group to 30 percent from 25 percent after meeting amended U.S. government requirements for raising the holding. Fiat will sell Chrysler models, including those under a Fiat Group badge, in Brazil and Europe, instead of Chrysler, after executing franchise agreements with 90 percent of Fiat dealers in Latin America to carry Chrysler products as previously required, Chrysler said on Tuesday. The U.S. Treasury and other holders agreed to the revision, a spokeswoman said. "It broadens the Chrysler Group-Fiat partnership and then it enhances the Chrysler Group's international position," Eileen Wunderlich, a spokeswoman for Chrysler, said. The change allows the carmakers to avoid negotiating new agreements with Fiat dealers in Brazil, where the company has the largest share of the automobile market. Sergio Marchionne, who runs both automakers, said in October the effort was difficult because of regulations governing dealers in the South American nation. The amended provision also calls for agreements that pool Chrysler and Fiat vehicles in Europe for emissions ratings and that compensates Chrysler for Fiat using its technology outside North America. An element that didn't change required Chrysler to meet a goal of $1.5 billion in revenue outside North America. The United Auto Workers union's retiree health-care trust now owns 59.2 percent of Chrysler, according to the statement. The U.S. Treasury holds 8.6 percent while Canadian governments have 2.2 percent. The owners approved the changes to the agreement within the past week, Wunderlich said. Marchionne is pushing Chrysler to increase its global sales 32 percent in 2011 and post its first annual net profit since emerging from bankruptcy reorganization in 2009. Fiat's stake increases to 30 percent as part of a plan to reach 51 percent this year and hold an initial public offering. Fiat agreed with the U.S. government after the bankruptcy to share technology and management with Chrysler in exchange for an initial 20 percent holding, with performance targets attached to the deal to increase the stake to 35 percent without paying any cash. Fiat can buy the remaining 16 percent needed to reach 51 percent. Fiat may pay $1.14 billion to exercise its call option on the last 16 percent if Marchionne makes the purchase in 2011 and $1.37 billion if he buys it next year, according to JPMorgan Chase & Co. analyst Ranjit Unnithan, who has an "underweight" rating on the stock. The cost is linked to Chrysler's earnings. Fiat expects to increase its holding to 35 percent by the fourth quarter after meeting a requirement for Chrysler to assemble a Fiat-derived car in the U.S. that gets 40 miles per gallon, Marchionne has said. 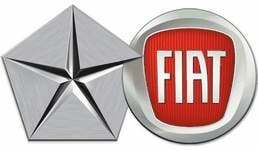 Fiat has 700 dealers in Latin America, including 550 in Brazil. Brazilian law prohibits Fiat from forcing the dealers to become Chrysler franchises, according to Stephan Keese, head of the automotive practice for Roland Berger Strategy Consultants in Sao Paulo. Brazil is Fiat's second-largest market by revenue, trailing Italy. The company sold 761,400 passenger and light-commercial vehicles there last year. Chrysler delivered 3,952 vehicles in the country in 2010, according to J.D. Power & Associates, a market researcher based in Westlake Village, California. Chrysler's best-selling vehicle in Brazil is the Mexico-built Dodge Journey SUV, which starts at 82,900 reais ($52,300). The Journey begins at $22,245 in the U.S., according to the brand's website. The automakers plan to rename the Journey as the Fiat Freemont for Brazil and Europe.